Virgin America, the low-fare, upscale airline, today celebrated the launch of new daily nonstop flights from San Francisco International Airport (SFO) to Honolulu International Airport (HNL) with a series of festive events in San Francisco and Honolulu – including the opportunity for workaholics to score the ultimate “Hawaiiscape” with Virgin Group Founder Richard Branson. To help celebrate its new Hawai‘i flights, Virgin America teamed up with the world’s leading community-driven hospitality company, Airbnb, to encourage travelers to “Work Hard, Hawai‘i Hard” by experiencing all that the Aloha state has to offer – including the option to stay at a range of unique properties from waterfront estates to beach bungalows. The two brands will co-host a festive send-off for the first Hawai‘i flight today and an oceanfront sunset event this evening at an Airbnb estate on O’ahu. On Dec. 3, the airline’s Hawai‘i schedule grows again with daily nonstop flights from SFO to Maui’s Kahului Airport (OGG). Virgin America also marked the launch of these new flights by offering SFO-Honolulu and SFO-Maui fares from $199 (taxes and fees included, restrictions applying) or 8558 Elevate(R) frequent flyer points (plus fees). As the only San Francisco-based airline, Virgin America offers an upscale new option to Hawai‘i – with a product uniquely suited to longer-haul flights. Hawai‘i is the number one tourism destination from the West Coast, with over 3.3 million visitors in 2014 and the ‘most wanted’ destination by members of the airline’s Elevate loyalty program. 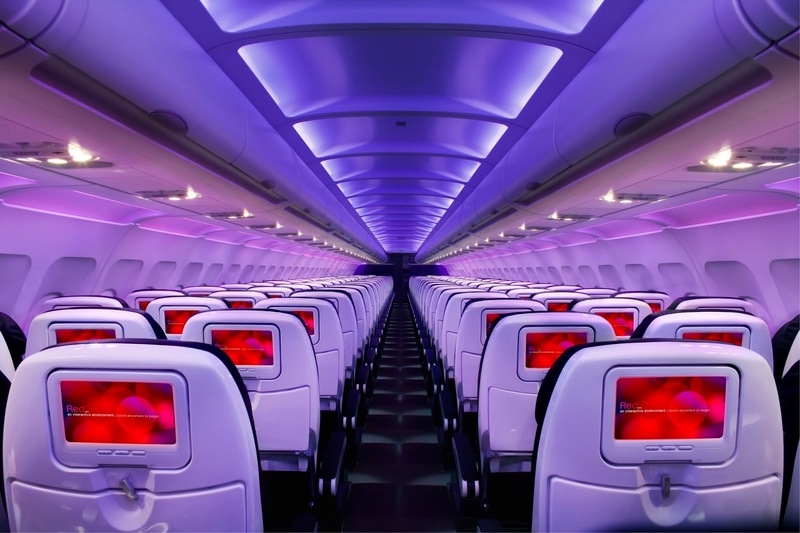 Known for its innovative and comfortable service, Virgin America has been named the best domestic airline in both Condé Nast Traveler's Readers' Choice Awards and in Travel + Leisure's World's Best Awards for the past eight years in a row. Today, Virgin America and Airbnb announced an expanded partnership program – the first partnership program of its kind for Airbnb. The airline’s Elevate program now offers travelers the opportunity to earn Elevate points for every Airbnb reservation they make. Members of the airline’s no-black-out date Elevate program can earn 1,500 Elevate points for their first Airbnb stay, and Elevate members who book through www.virginamerica.com will also get 1 point per $1 spent on completed Airbnb trips. Additionally, Elevate members who become Airbnb hosts will earn 20,000 Elevate points. For more, visit: virginamerica.com/airbnb. Earlier this summer, Virgin America and Airbnb teamed up to offer the ultimate “Work Hard, Hawai‘i Hard” escape – with Branson kicking off the campaign with a video and LinkedIn post on making time to recharge. More than 65,000 entered the #Hawaiiscape promotion and winners scored a seat on the first flight, the chance to party with Branson at an Airbnb residence on O’ahu tonight, and some “play hard” lessons with professional athletes captured with GoPros. Virgin America and Airbnb also announced today that the companies will pledge $100,000 (in cash, flights and Airbnb accommodation credits) to Make-A-Wish Hawai‘i(R) to help fulfill the wishes of children battling life-threatening illnesses. As part of its efforts to plant new roots in the Hawai‘i community, Virgin America is also proud to announce a partnership with P?nana Leo, a nonprofit that provides for and nurtures various Hawaiian language environments. Started by a group of Hawaiian language educators in 1982, the organization’s advocacy has resulted in an education system in which students in Hawai‘i may study from preschool all the way through doctoral-level studies in Hawaiian indigenous language. The airline is providing $25,000 to support the organization’s education programs. “The U.S. West market is a significant source of inbound visitors to the Hawaiian Islands and we look forward to welcoming Virgin America passengers from the Bay Area and across the airline’s U.S. network,” said George D. Szigeti, president and CEO of the Hawai‘i Tourism Authority (HTA). Virgin America will fly to Hawai‘i with its newest Airbus A320 aircraft, equipped with fuel-saving ‘sharklet’ wingtip devices. 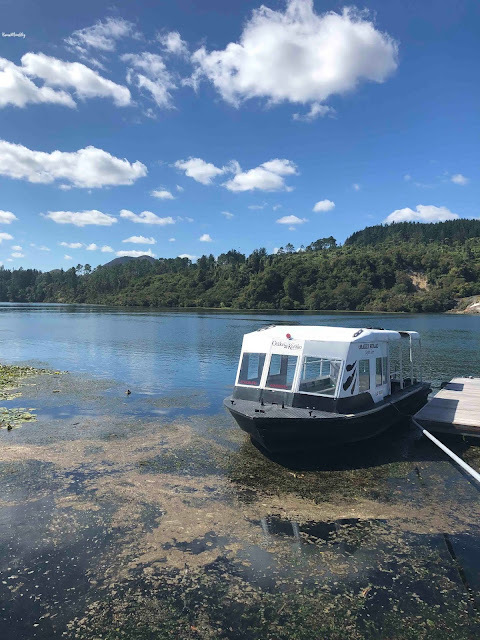 Earlier this year, the airline completed the Federal Aviation Administration's Extended Operation certification in order to operate longer range overwater flights. The first of Virgin America’s aircraft to fly to Hawai‘i was named “Pineapple Express” by the airline’s teammates and features a surfer girl image created by street/tattoo artist Si Scott. 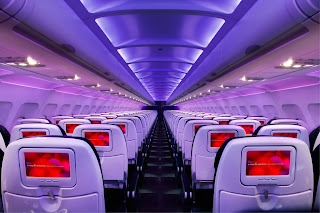 Virgin America offers mood-lit aircraft with three custom-designed classes of service, touch-screen personal entertainment and an on-demand food and cocktail menu on every flight – so travelers departing from SFO’s convenient Terminal Two can kick-off their Hawai‘i holiday as soon as they step onboard. In addition to a Main Cabin that offers custom leather seating with a deeper, more comfortable pitch, the airline's First Class cabin offers plush white leather seating with 55 inches of pitch, 165 degrees of recline and lumbar massagers. The carrier's Main Cabin Select service offers 38-inches of pitch, free food and cocktails, an all-access pass to media, dedicated overhead bins and priority check-in/boarding. 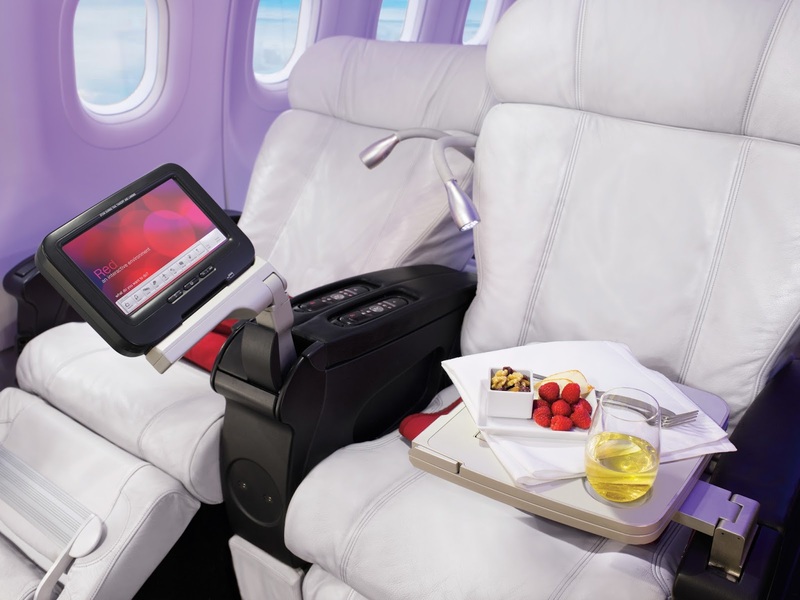 The Red™ entertainment platform offers guests their own seatback touch-screen, with +20 latest release films, TV, interactive maps, videogames, a 3,000 song library, surround sound technology and an on-demand menu, which allows flyers to order from their seatback any time during a flight. With a full service First Class menu and a unique on-demand menu in the Main Cabin, Virgin America was named Travel + Leisure Magazine’s “Best U.S. Airline for Food” in 2014 and 2015. The Main Cabin menu en route to the islands includes Pacific-rim inspired options such as a Korean Chicken Sandwich and Ginger Soba Chicken Salad. In First Class, guests can choose from island-sourced fresh dishes including a grilled pineapple appetizer, Crispy Thai Chicken with a macadamia nut crust and Liliko‘i Ice Cream. Island libations are available on Hawai‘i-bound flights, including a POG Mimosa in First Class and a Makena rum cocktail. 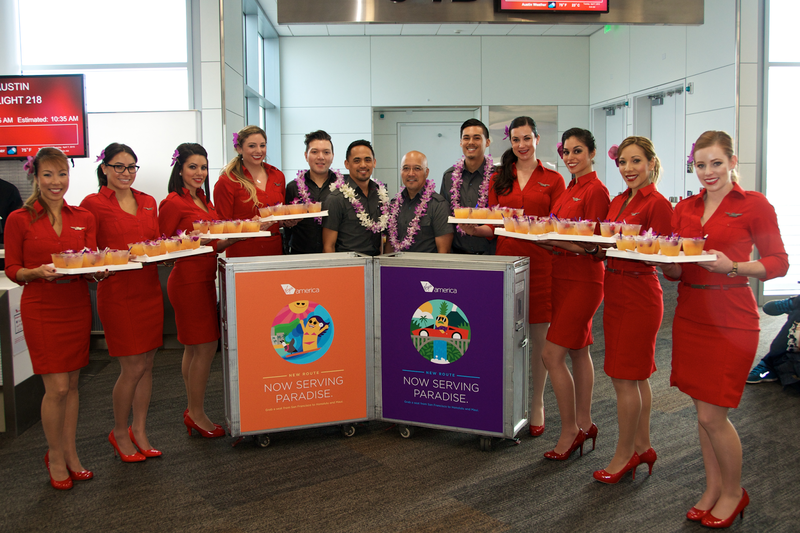 Since its 2007 launch, Virgin America has created nearly 3,000 jobs (including 40 new jobs created in Hawai‘i). The new Hawai‘i markets represent the 22nd and 23rd destinations served by the California-based airline. WiFi is available on all domestic mainland flights, however it will not be available on Hawai‘i flights until mid 2016 – when the airline’s new ViaSat satellite WiFi becomes available. Live TV will not be available to Hawai‘i, however guests can watch movies, play games or watch complimentary TV, like Netflix’s House of Cards.